According to the NFL, 70 percent of fans use a second screen while watching football. It’s easy to understand why: mobile devices—and the apps that run on them—give us easy access to player stats and analysis, provide interactive features to supplement the big-screen experience, and offer a convenient way to communicate with other fans watching the game. We’ve rounded up six of the best second-screen apps to enhance your football viewing. Take them for a spin when the season kicks off Thursday, September 8, and we’re sure you’ll be reaching for them along with your remote every week until the end of Super Bowl LI. Verizon has a lock on showing NFL games on mobile phones. A year ago, the NFL seemed as determined to conquer the second screen as effectively as it has the TV screen, offering a dizzying array of official apps. It has pared down and consolidated its offerings since then, but NFL Mobile remains the league’s digital flagship. This free app gives you everything you’d expect: news, real-time scoring, video highlights, radio broadcasts, customizable team alerts, and push notifications. You also get access to Game Pass, the league’s on-demand video subscription service. If you’re willing to pay $100 and don’t mind watching games after they’ve aired, you can replay any of the season’s 256 match-ups on your mobile device. NFL Mobile offers Verizon customers a few extra perks with a More Everything plan. You get 24/7 access to the NFL Network on your phone, and you can live-stream all nationally broadcast games on that channel as well as those on CBS, NBC, Fox, and ESPN. If you miss a game for whatever reason, NFL Mobile’s at-a-glance recap is indispensable for catching up. Xbox has more to offer football fans than endless hours playing Madden. Thanks to Microsoft’s partnership with the NFL, your console will give you the best possible field position to follow the upcoming season. The NFL app for Xbox One’s “Next Gen Stats” feature is similar to what’s been used in actual NFL broadcasts. 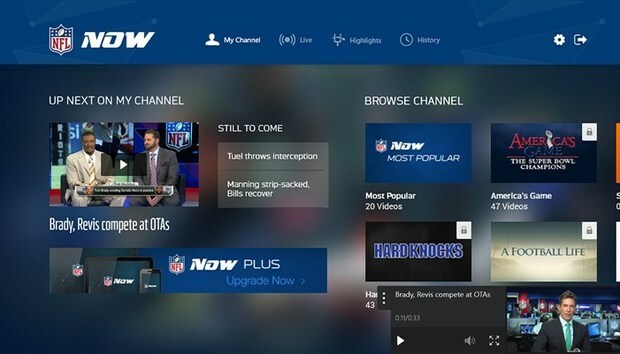 Subscribers to the NFL Network and NFL Sunday Ticket can watch commentary programs and live games respectively, directly through the app. But the app also includes a wealth of features for fantasy owners and armchair quarterbacks alike, including game-day notifications, multi-angle replays, and real-time player tracking. Most impressive is its “Next Gen Stats” feature—similar to what’s been used in actual NFL broadcasts—which delivers player data such as distance traveled, top speed, and routes run. The elegant integration of live games with instant data and analysis makes this the next best thing to being in the broadcast booth. If you’re an ESPN fantasy football owner, you have more than bragging rights on the line with each game. The ESPN Fantasy app provides every tool you need to stay on top of your squad all season long. This free app gives you full access to your ESPN fantasy team, letting you start, bench, add, drop, trade, and waive players and otherwise manage your roster in the lead-up to game day. It also provides the most comprehensive collection of stats and analysis you’ll find outside of an NFL war room. ESPN’s Fantasy Sports app gives you everything you need to manage your team all season long. While you’re glued to the tube during games, Fantasycast keeps you updated on all your fantasy players’ scoring in real time, while push notifications alert you to injuries, trades, and other player news. Even if you’ve never stepped foot on a football field, this app could make you the Bill Belichick of your office league. If you want to keep your fantasy focus strictly on football, check out the league’s official fantasy app. It puts everything you need to manage your NFL fantasy team right in the palm of your hands. The league’s official fantasy app provides news and stats straight from the NFL. Draft from anywhere, then make week-to-week adjustments with the help of live scoring, expert analysis, and news and stats straight from the NFL. You’ll also get video highlights of all your team’s key plays. Keep the chat feature handy to talk trash to your opponents while you’re watching the real-life games. FanCred lets you show off your team spirit to other passionate fans during the game. From the Washington Redskins’ Hogettes to the denizens of the Oakland Raiders’ Black Hole, football fans have unique ways of showing their devotion to their team. FanCred is a free app that helps you harness that passion and share it with other fans. FanCred is a social network that works like any other, but because it’s designed for sports fans, your followers are genuinely interested in your check-ins to Soldier Field and your latest fantasy football trades. Create a profile and select your favorite team and you’ll receive a feed containing news, scores, and comments from other fans. If the prospect of socializing with your sports tribe isn’t enough, you can even play broadcaster by posting Periscope-style streams from your sofa or the stadium. This network is not for lurkers: You’ll also receive a FanCred Score, ranking you from 1 to 100 based on how much you post and interact with other users, so make sure you get in the game. SportsYapper lets you talk about the game with other viewers in real time. Venting your football frustrations to the general population on Facebook or Twitter is unsatisfying for you and downright annoying for your friends and followers. SportsYapper offers a more welcoming forum where your opinions and rants will always find a sympathetic ear. Beyond sports chatter, the free app lets you upload and search photos of game gatherings, and it will alert you when a game is about to start or when a friend logs in.